Landmark Golf LP has been based in Indian Wells, California since 1992. Landmark is an internationally recognized real estate development company with the proven in-house abilities to provide complete real estate development services including all facets of golf course facilities design, development, construction management services and golf operations management. 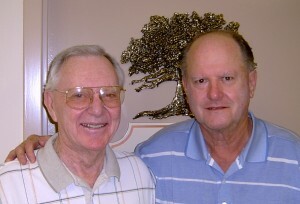 Ernie Vossler and Joe Walser, Jr. formed their initial company, Unique Golf Concepts in 1971. Landmark Land Company, Inc., a publicly owned company, purchased Unique Golf Concepts in 1974; subsequently, Vossler and Walser oversaw the tremendous growth of Landmark Land Company including such master planned real estate development golf projects as PGA West, La Quinta Hotel Golf & Tennis Resort, Mission Hills Country Club, Oak Tree Golf Club, Oak Tree Country Club, Kiawah Island Inn and Golf Resort, Carmel Valley Ranch Resort and Palm Beach Polo and Country Club. Landmark Golf offers real estate master planning, entitlement processing, real estate development, golf course design, golf development/construction services and operations management services to clients seeking the same quality and high standards that are evident in the successful developments listed above. Ernie Vossler has been honored over the course of his illustrious career for his love of the game of golf, his extraordinary vision, the strength of his experience and his team’s remarkable accomplishments. In September 2005, Vossler was inducted as a Member of the PGA of America Golf Professional Hall of Fame for his “dedication to and passion for the game of golf…along with his service and accomplishments.” In 1967, Vossler was named PGA Professional of the Year for his outstanding abilities as a golf club operator and teaching professional. Teaching golf was always his passion, and many of his students have achieved great success on the PGA Tour, Champions Tour and LPGA Tour. Vossler’s recent recognitions included the Southern California Section of the PGA of America President’s Award. Golf has been at the core of Vossler’s existence since his first wins in Fort Worth, Texas on Pascal High School’s golf team where he began a friendship with fellow teammate Dan Jenkins, who went on to make the golf course they played together, “Goat Hills,” famous in Jenkins’ best-selling novels and articles in Sports Illustrated. While starting his golf career, Vossler ran his father’s plumbing contracting business in Fort Worth, TX and credits his close working relationship with his father for teaching him the “people skills,” business practices and construction disciplines that were the foundation of Vossler’s philosophies on life, golf and real estate development. When Ernie Vossler was making a name for himself in amateur golf, fellow Texans Ben Hogan and Byron Nelson wrote letters on his behalf for his admittance to the PGA Tour. It worked! As a PGA Tour member, Vossler won five times between 1955-1962 and developed long-term relationships with the “who’s who” in golf including Joe Walser, Jr., Johnny Pott, Mark McCormack, Deane Beman, Arnold Palmer, Jack Nicklaus, Pete Dye, Harvey Pennick and many others who had an impact on Vossler’s life and left him with countless stories to share. To provide stability for his growing family, Vossler cut back from playing the PGA Tour on a full time basis to accept a position as head golf professional at Quail Creek Golf and Country Club in Oklahoma City while the golf course and residential community were in design, developmental and sell-out phases; he remained at Quail Creek as the head golf professional for over a decade. Vossler established the relationship between the PGA of America, the PGA Tour and Quail Creek Country Club by hosting the annual Oklahoma City Open in the 1960-70s. It was during his days at Quail Creek that Vossler began to fully appreciate the value of a recognizable and marketable logo for a successful real estate golf community. During the 1960-70s, the competitive nature of the PGA Tour continued to call Vossler to the “winter tour” which annually took him to expanding golf areas such as Phoenix/Scottsdale, Las Vegas, the Palm Springs area for the Desert Classic, now known as the Humana Challenge, and to northern California for the Bing Crosby National Pro-Am at Pebble Beach. It was during these travels that Vossler would study golf course design, the best in residential developments, luxury amenities, quality service and the desires of avid golfing families, while spending his hours away from golf courses looking at undeveloped land in each area of the country he visited. In 1971, Vossler and Joe Walser, Jr. founded Unique Golf Concepts, Inc. to pursue their dreams of building exceptional golf communities. One of the first team members Vossler and Walser added to Unique Golf Concepts was Johnny Pott, their friend from the PGA Tour. They began with the developments of Marsh Island Golf Club in Ocean Springs, Mississippi, The Cardinal Club in Greensboro, North Carolina and Oak Tree Golf Club in Edmond, Oklahoma. Vossler continued “California dreaming” while acquiring real estate options for undeveloped land that would become La Quinta Hotel Golf & Tennis Resort and Carmel Valley Ranch Resort. The early achievements of Vossler, Walser and Pott, as golf community real estate developers, and their close association opened the door to greater opportunities. While nurturing very close ties with the PGA of America and the PGA Tour, Vossler, Walser and their Landmark team were credited with being on the cutting edge of golf club membership marketing concepts with “bundled charges” and prominent promotion of the “Oak Tree” logo worn on national television weekly by top PGA Tour and LPGA Tour professionals, many of whom represented and lived in Landmark-developed residential golf communities such as Oak Tree, Mission Hills and PGA West. Developments which achieved national prominence during the1980s under the direction of Vossler and his associates include: PGA West, La Quinta Hotel Golf & Tennis Resort, Mission Hills, Carmel Valley Ranch Resort, Moreno Valley Ranch, Oak Tree Golf Club, Oak Tree Country Club, Palm Beach Polo and Country Club and Kiawah Island Inn and Golf Resort. These golf courses are renowned for hosting prestigious tournaments such as the Bob Hope Chrysler Classic, the Nabisco Dinah Shore, PGA Championship, Ryder Cup, The Skins Game, Senior Skins Game, U.S. Amateur and the World Cup of Golf. In 1992, Vossler established Landmark Golf Limited Partnership with plans to pursue new golf/real estate development opportunities primarily in Southern California, Phoenix/Scottsdale, Arizona and Las Vegas, Nevada; albeit, an interesting assignment took Vossler and his team to Mission Hills Resort in Guan Lan Town, Shenzhen, China, where they consulted on the development of two golf courses. As Joe Walser, Johnny Pott and Andy Vossler joined Landmark Golf in the early 1990s as Vossler’s partners, and other Landmark Land alums came onboard, the Company was already well under way with Ernie Vossler at the helm of design, development, construction and/or golf operations management at the La Vegas Paiute Resort. Soon to follow came: The Plantation Golf Club, Landmark Golf Club, Oak Valley, Landmark Golf Club at Oak Quarry, The Golf Club of California, Landmark at Hemet Golf Club, The Ranch Golf Club, Mountain Falls Golf Club, Shadow Hills Golf Club and SilverRock Resort. Ernie Vossler passed away in La Quinta, California on February 16, 2013 at the age of 84. Through his multi-faceted career, Joe Walser, Jr. has been recognized and written about for his dedication to golf as a sport and as a business. Quality, consistency and strength of experience were the hallmarks of Walser’s leadership and his team’s notable accomplishments for which he was inducted into the Southern California Section of the PGA of America Hall of Fame in 2005. When Joe Walser, Jr. attended Capitol Hill High School in Oklahoma City, his golf team won three State Championships. His talents were recognized with a full scholarship to Oklahoma State University where his team won several Conference Championships, and he earned a Bachelors Degree in Education. Walser went on to win 25 amateur tournaments including the Oklahoma State Amateur and the Oklahoma Open, which led him to a successful career in golf. Walser “turned pro” in 1959 and joined the PGA Tour. After two years on the PGA Tour, Walser embarked on what became 15 years in positions of head golf professional, general manager and director of golf at Oklahoma City Golf and Country Club, Lake Hefner Golf Club and Altus Country Club. Walser served as president of the South Central Section of the PGA of America for two consecutive years and served two terms on the PGA of America Board of Directors. In 1970, Walser was presented with the PGA of America Horton Smith Award which recognized his contributions to the education of fellow golf professionals. Walser’s commitment to education and training of the business aspects in the profession of golf is evidenced by his mentoring of many outstanding club golf professionals such as Jim Brotherton Jr., a recent PGA of America Golf Professional of the Year. Walser maintained the close ties he developed through the PGA of America and the PGA Tour with the “who’s who” in golf including Deane Beman, Arnold Palmer, Jack Nicklaus, Pete Dye, Jim Awtrey, Pat Rielly and many others who had an impact on Walser’s life and left him with memorable stories to share. In 1971, Walser and Ernie Vossler founded Unique Golf Concepts, Inc. to pursue their dreams of building exceptional golf communities. One of the first team members Walser and Vossler added to Unique Golf Concepts was Johnny Pott, their friend from the PGA Tour. They began with the developments of: Marsh Island Golf Club in Ocean Springs, Mississippi, The Cardinal Club in Greensboro, North Carolina and Oak Tree Golf Club in Edmond, Oklahoma. Walser and Vossler used their knowledge of great golf locations from years of participating on the PGA Tour to help them identify and acquire options for undeveloped land that would become La Quinta Hotel Golf & Tennis Resort and Carmel Valley Ranch Resort. The early achievements of Vossler, Walser and Pott, as golf community real estate developers, and their close association which, paved the way for greater opportunities. In 1974, Walser was named a senior vice president of Landmark Land Company Inc. in charge of golf operations, golf course design and construction. Walser remained in Oklahoma to spearhead the development of Oak Tree Golf Club and Oak Tree Country Club before relocating to La Quinta, California for the development of PGA West. While nurturing very close ties with the PGA of America and the PGA Tour, Walser, Vossler and their Landmark team were credited with being on the cutting edge of golf club membership marketing concepts with “bundled charges” and prominent promotion of the “Oak Tree” logo worn on national television weekly by top PGA Tour and LPGA Tour professionals, many of whom represented and lived in Landmark-developed residential golf communities such as Oak Tree, Mission Hills and PGA West. Developments which achieved national prominence during the1980s under the direction of Walser and his associates include: PGA West, La Quinta Hotel Golf & Tennis Resort, Mission Hills, Carmel Valley Ranch Resort, Moreno Valley Ranch, Oak Tree Golf Club, Oak Tree Country Club, Palm Beach Polo and Country Club and Kiawah Island Inn and Golf Resort. These golf courses are renowned for hosting prestigious tournaments such as the Bob Hope Chrysler Classic, the Nabisco Dinah Shore, PGA Championship, Ryder Cup, The Skins Game, Senior Skins Game, U.S. Amateur and the World Cup of Golf. From 1992-1996, Walser was chief operating officer for PGA Tour Golf Course Properties, Inc., overseeing Tournament Players Clubs, PGA Tour Design Services, Inc. and PGA Tour Construction Services, Inc. in Ponte Vera Beach, Florida. Walser also represented the PGA Tour at PGA of America board meetings. In 1996, Walser rejoined Ernie Vossler, Johnny Pott and Andy Vossler as a partner in Landmark Golf Limited Partnership, which was involved with design, development, construction and/or golf operations management at the Las Vegas Paiute Resort; followed by the Plantation Golf Club, Landmark Golf Club, Oak Valley, Landmark Golf Club at Oak Quarry, The Golf Club of California, Landmark at Hemet Golf Club, The Ranch Golf Club, Mountain Falls Golf Club, Shadow Hills Golf Club and SilverRock Resort. Joe Walser Jr. passed away in Dallas, Texas on May 10, 2012 at the age of 79.